Rabbi Yechiel Eckstein, who raised billions for the poor, assisted Chabad worldwide and helped release Sholom Rubashkin, passed away. 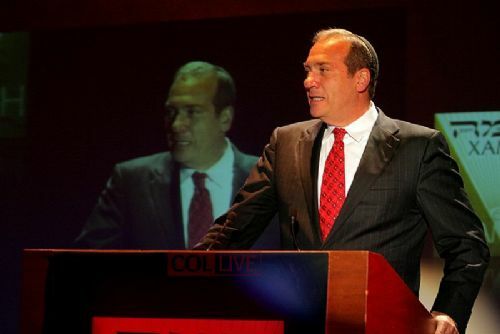 Rabbi Yechiel Eckstein, the larger than life figure who raised billions of dollars from devout Christians to support Jewish causes worldwide, passed away on Wednesday, 1 Adar I 5779. The was 67 and suffered sudden heart failure, the Jerusalem Post reported. Eckstein was born in Manhattan, New York, to Rabbi and psychologist Dr. Simon “Sy” Eckstein and his wife Belle Eckstein of Tampa, Florida. The family moved to Ottawa, Canada, where his father served as a rabbi. He received Orthodox Rabbinic ordination from Yeshiva University in New York and held a master’s degrees from Yeshiva University and Columbia University, where he also completed studies for his doctorate. He has served on the faculties of Columbia University, Chicago Theological Seminary, and Northern Baptist Seminary. After serving as national co-director of inter-religious affairs for the Anti-Defamation League, Eckstein founded what would become International Fellowship of Christians and Jews in 1983. The Fellowship, as it as called, has raised more than $1.4 billion for programs helping Jews in Israel, the former Soviet Union, Latin America, Ethiopia, and over 50 countries. Originally, the majority of the donations were given by fellow Jews. Often these gifts were grudgingly given. “I don’t know what you’re doing, and I don’t know if I like what you’re doing,” one Jewish philanthropist from Chicago said to him, but he nonetheless donated. But from the mid-1990s, he became increasingly popular with Evangelical Christians,l eading to rapidly increasing growth of the charity each year. By 2003, the International Fellowship of Christians and Jews was listed as the second largest charity in Israel. Chabad’s institutions have taken the support at face value and have partnered with Eckstein over the years to build and run educational programs and humanitarian causes, among them Colel Chabad, Federation of Jewish Communities in Russia, and Chamah International. Following terror attacks, Fellowship gave more than $3.5 million in security funding to over 30 Jewish communities and Chabad centers in France, Argentina, Brazil, China, Cypress, Croatia, Denmark, Germany, Nepal, Spain, Thailand and the once targeted Chabad House of Mumbai, India. Eckstein began his Fellowship in Chicago and later moved to Israel. He was often listed as one of the “Most Influential Rabbis” in America and worldwide by Newsweek magazine and the Jerusalem Post. He has also recorded six albums as a singer and has been a member of the bands Kol Salonika, The Y’DID Singers and The Rabbis’ Sons. When attending the annual gala dinners of Colel Chabad and Chamah, Eckstein would bring a guitar with him and sing to the audience. In December 2017, Eckstein was instrumental in obtaining from President Donald Trump the commutation for Sholom Mordechai Rubashkin, the former kosher meat plant executive from Iowa who was harshly sentenced. He is survived by his wife Joelle Eckstein, three daughters and eight grandchildren. Baruch Dayan Haemes: Yechiel ben Shimon.